Eight days out from the Chicago Marathon, I decided to run a local 5K that I've never run before. I had always been leery of any race with the words "All-Terrain" in the name because I do not perform well on trails or grass. 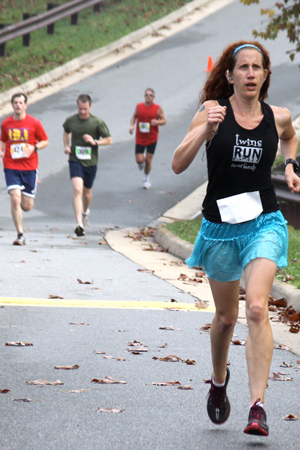 I ran my first and only trail race back in 2007. I fell twice and nearly tripped multiple times over 6.2 anxiety-ridden miles. 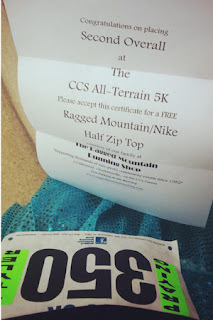 I ran my first cross-country race last year and, once again, I was so terrified of slipping and falling that I had a lackluster time (both in terms of finishing and enjoying the experience!). 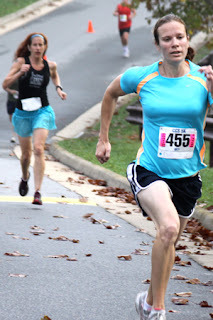 Since I'm going to be moving next summer, I figured this is the last time I could try the course and when I saw amazing race pictures from the previous year's event, I knew I had to give it a shot (yes, I'm obsessed with getting race photos!). 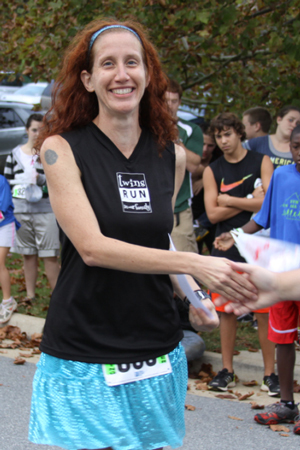 My goal for the Charlottesville Catholic School All-Terrain 5K was to NOT get injured. I knew I wasn't going to PR on a course that wasn't exclusively on pavement, so some of the pressure was off. After reviewing past race results, I knew that I could place in the top 3 overall if nobody super fast showed up or at least win my age group. The first mile was on the road or paved trail so I flew through that in 7:07. Then it started to get challenging and I stopped checking my watch and just tried to keep up with those around me and not get passed. I spent most of the 2nd mile behind a high school girl and a much younger boy. As soon as there was an opening, I passed both and didn't look back. 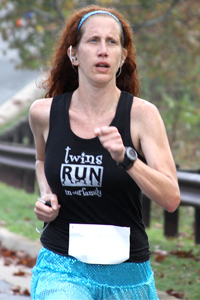 With less than a mile to go, I heard a woman say, "You're the first woman! Go!" and my first thought was, "Uh oh, I'm going to blow it!" I knew I didn't have it in me to sprint to the finish line after barely making it up the last steep hill.